Next time you head through security, you may be getting more than pat-down. If you’re lucky, you might just have your bags and person exposed to bee arrays. These specially-trained (and just plain special) insects will stick their tongues out if they smell whatever the nice TSA person is looking for. TNT, crack, pirated music, it’s all the same to bees, who know they get a treat whenever they smell their special smell. They’re trained by Inscentinel, a company which has one too many portmanteaus in its name. 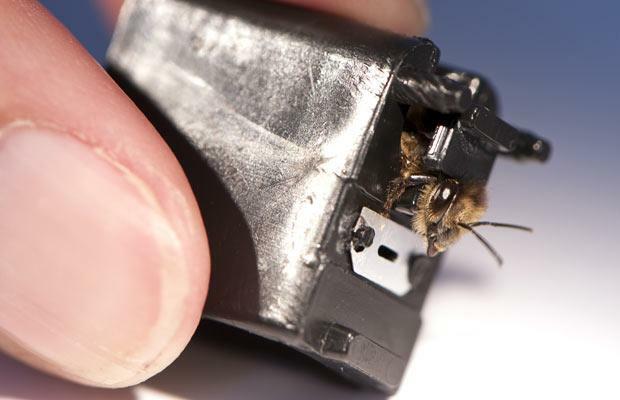 I’ve heard of this kind of thing for years, but this is definitely the first bee-in-a-box I’ve seen.The story and more images can be found at the Daily Telegraph.